I know, you hear the word “brooch” and immediate you think of your grandmother or that aunt that wore too much perfume or the ladies at the country club. We need to re-frame and re-position the brooch because, really, it is a tremendously versatile piece when you apply a little creativity. There are endless incarnations of the brooch – from the vintage to the glamorous, the fun and the frivolous, the storied collector’s piece and the modern. 1. Attach to a fabric or rope belt. Coolest belt buckle ever. 2. Pop your collar, add messy up-do, and place it right in the middle of the back of your collar. Because making an excellent exit is as good as making an entrance. 3. Pin to your purse – day or night – to dress up that clutch. 4. Wear it in your hair. 5. Those floppy hats everyone is wearing? Pin them and make them more interesting. 6. Use a pair of bar pins on a flowy, wide-strapped tank top to add some evening elegance. 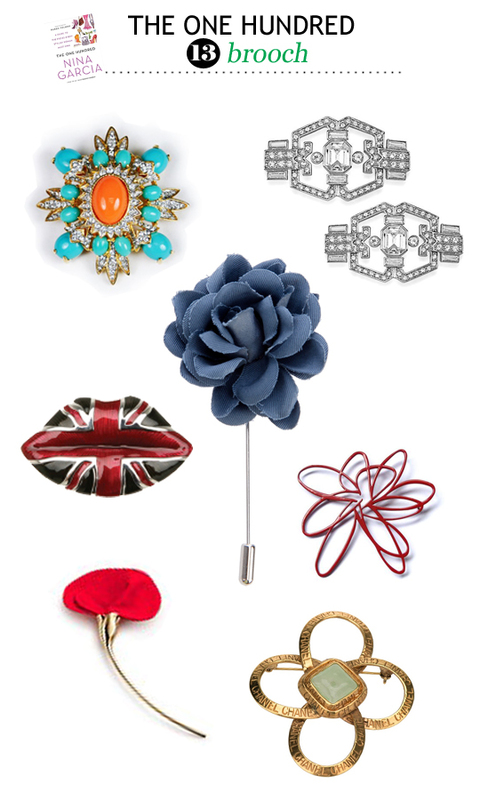 Want to learn more about brooches? Of course you do. Pick up a copy of Nina Garcia’s “The One Hundred” for yourself! We’re working our way through all 100 items to assemble the perfectly stylish, workable collection.